Do you want to put an end to unnecessary and treacherous speeding? Look no further than Speedbumps. Speed bumps compel cars to reduce their speed and maintain the speed limit. Speedbumps are simply the barriers used in traffic administration, making them a great way to keep your property and parking lot safe. They also ensure that parking lot traffic is moving at a reasonable speed. They are the most frequently used structural traffic calming components. Speed bumps can be made of metal, rubber, plastic, concrete, or asphalt. Why do we need speed bumps? Speed bumps really serve multiple purposes, despite the fact that a number of drivers may find them a bit inconvenient. When it comes to guiding against both severe and minor traffic-related injuries and fatalities, speed bumps are very useful. Speed bumps are particularly made to curb recklessness and slow vehicles down, thereby making parking lots safer. This will guarantee and enhance the safety of pedestrians and vehicles on roadways, in alleys, and around parking lots. Speed bumps are best used in places where you just want to keep the traffic moving at a reasonable speed. Speed bumps will make drivers who drive at high speed slow down in places having several speed bumps. This may not just reduce the amount of traffic overcrowding in a hectic, busy location, but also keep guiltless road users from possibly crossing paths with a careless driver. Alerting drivers to reduce their speed and slow down completely is the main idea behind installing speed bump in parking lots. Speed bumps may play a significant safety role in high traffic areas like a parking lot because driver visibility may be restricted by so much activity. There are more than a few vehicles arriving all at the same time in a parking lot, trying to enter into parking spaces and back out, and also trying to depart. Adding to this overcrowding, are many pedestrians riding bicycles, walking on foot, or trying to cross from a lot of different directions. Since parking lots are not often patrolled by police, a speed bump may be an effective means for implementing speed control among drivers. The noise levels will reduce tremendously as well when the volume of traffic and vehicle speed is reduced. It can be dangerous for pedestrians, particularly kids and the elderly to cross a parking lot or street. 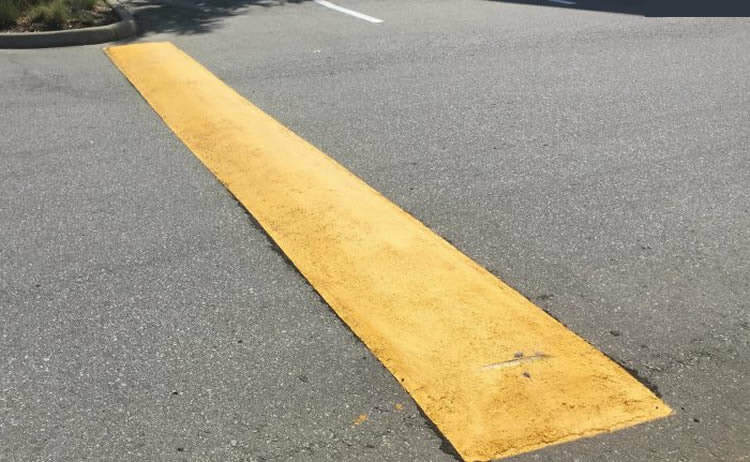 Installing speed bumps in parking lots with heavy foot traffic will put drivers on alert to slow down and be careful, and also offer important safety protection for pedestrians. What is the difference between speed bumps and speed humps? Figuring out the difference between speed bumps and speed humps on the roads can be very confusing. However, the fact that the two of them help slow a vehicle down and control speed is the most commonly known fact. Both speed and hump bumps are designed to deal with the current problem of speeding. Rarely used on public roads as they necessitate vehicles to come to a near stop in order to pass over them, and can cause damage to vehicles moving at normal speeds. They are particularly designed for use in parking lots, school entrances, front of stores, near stop sign places, garages, and pedestrian crossings.